Can FinTech respond to the rise of Alternative Investments? Home - Trade Insider - Fintech - Can FinTech respond to the rise of Alternative Investments? Alternative investments are on the rise. In the era of geopolitical turbulences, business environment with low interest rates and secular stagnation, well-informed risk takers are actively pursuing better return and unconventional investment platforms. Since the underlying financial crisis, which started ten years ago, diversifying portfolio by opting out of equity and fixed income was one of the methods of reaching returns that would not necessarily be linked to the zero-bound interest rate policy of Central Banks. Over the last 12 years, alternative investments have become seven times more appealing, with 11 percent compounded annual growth rate during the last decade, thus raising awareness amongst not only institutional investors, but academia and research bodies as well. The generators of such growth can be traced both to macroeconomic fundamentals and behavior switch of customers in emerging economies, which has been moved from saving to investing positions. Demographics and social mobility represents an additional important mechanism, mainly set in the increase of middle class, projected to reach one billion customers in four years. Moreover, the diversity and complex nature of such assets require higher service fee, motivating market participants even further. 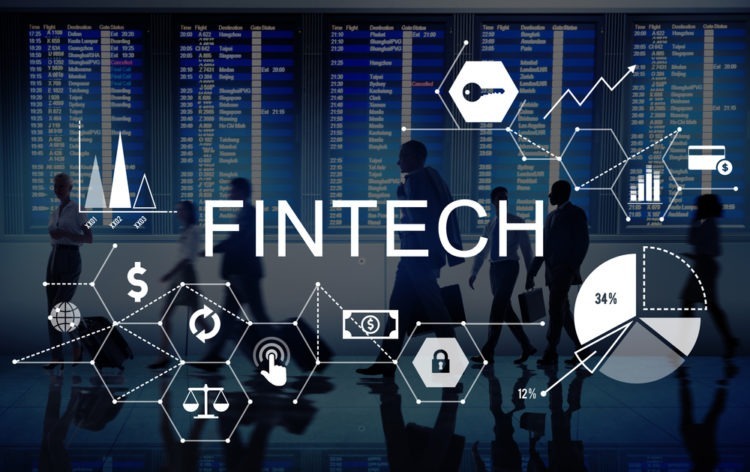 Underserved customer segments and increased demand for unconventional investment products, combined with the improved financial literacy and globalized market place can be observed as the ideal opportunity for FinTech companies, given their flexibility and required resources when compared to traditional financial institutions. Including real estate, funds, commodities and collections, this type of investment helped investors to diversify their portfolios. The mentioned asset classes are lightly regulated and, under general considerations, illiquid. However, with the advent of technology and rapid financial innovation, the nature of alternative investments can be adjusted, offering complex and “liquid alternatives” products. While traditional financial institutions are technology savvy, with well-developed track record of dealing with the alternative investments, it can be expected that one part of their strategy will be positioned around cooperation with the enabling technology, such as FinTech, given the flexibility and regulatory premium. According to PwC, in the following 3 to 5 years, 82% of traditional financial institutions will boost partnership with FinTech, expecting 20% of ROI on activities led by FinTech. Cooperation, and not competition, can be the key word in explaining their relationship in close future. Furthermore, the technology which is the core of any FinTech can be deployed for demand creation, given the vast possibilities in making different product structure. 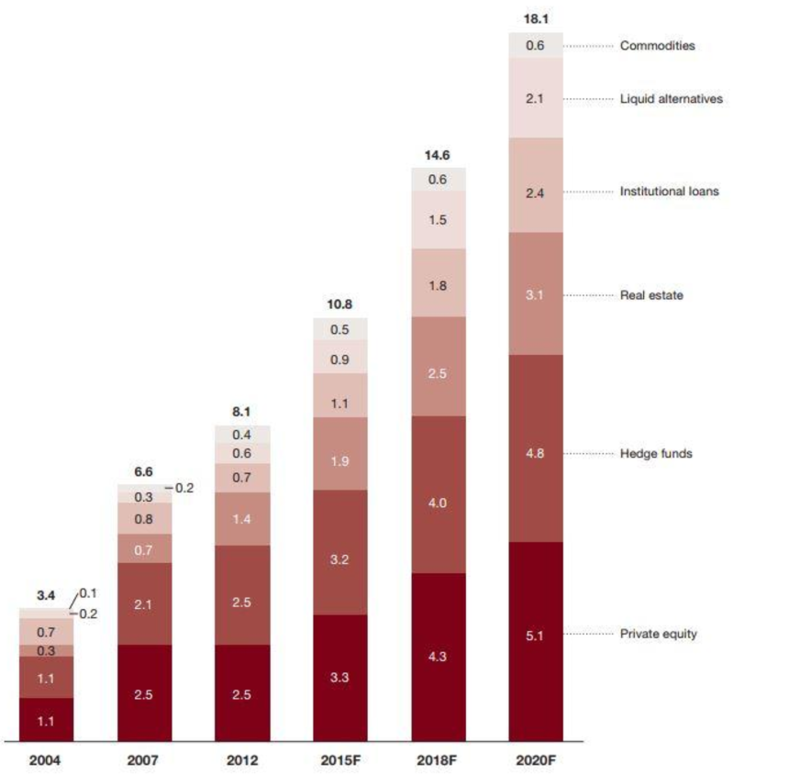 From the diagram, originally published in PwC report on alternative investments, one can observe that the projections for alternative investments are more than optimistic. Certainly, significant portion will be managed by traditional financial institutions, however, given that both structure of alternative investment and FinTech are technology-led, FinTech will become a very important player in the market, offering services to underrepresented segments and tapping in the money stream. On the backside, however, the regulatory issue may present one of the most unrelenting challenges when enabling technologies are concerned. Additionally, compliance is becoming more complex, and, together with the relatively strict risk reporting requirements may increase administrative and operational cost. This, however, can push smaller FinTechs towards more cooperation with the traditional financial institutions or make them to modify business strategy.